Join us this Saturday for the first of two appearances this term by the St Clement's Players. They'll be presenting a programme of orchestral music by Mozart and Schubert. Flautist Chloë Gamlin, a student at Cambridge University, joins the orchestra for the beautiful Mozart Flute Concerto No. 2 which is paired with Schubert's energetic Symphony No. 5 in B-flat major. 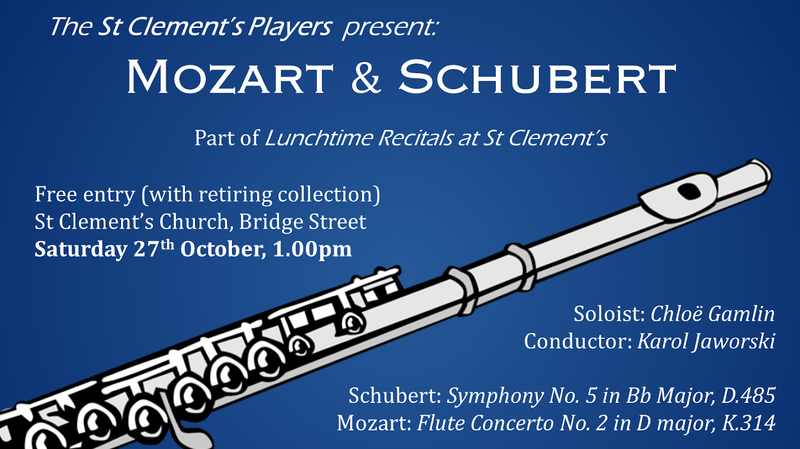 We do hope you are able to join us for this recital, at 1pm on Sat 27th Oct at St Clement's Church. As ever, entry to the recital is free, with a retiring collection taken to support the recital series and contribute to the Organ Redevelopment Fund at St Clement's. We look forward to seeing you there! Join us this Saturday lunchtime for the next installment of this term's recital series. This week we welcome The Maestral Ensemble. Their programme is entitled "Music from the Age of Exploration"; beginning in Spain before the Age of Exploration, they will bring the audience to trading centers in Italy and the Netherlands, where musical ideas flowed and changed, ending the journey in Peru. This concert features music from The Red Book of Montserrat, Isaac, Merula, and Bocanegra's Ritual Formulario. As ever, entry to all our recitals is free, and a retiring collection will be taken to support the series and raise funds for our Organ Redevelopment Fund. The recital begins at 1.00pm, and we hope to see you there! Join us on Friday evening for a Healing service for the Feast of St Luke. We begin at 7.30pm with prayers, reading, Taizé chants, and reflective silence as we ask for God's healing and compassion in our lives. In the service there will be the option, for those who wish, to be anointed with oil as a sign of receiving God's forgiveness and healing touch in our lives. There will also be an opportunity for the laying on of hands in prayer, or for someone to pray with and for you or others. All are welcome, and we hope to see you there. 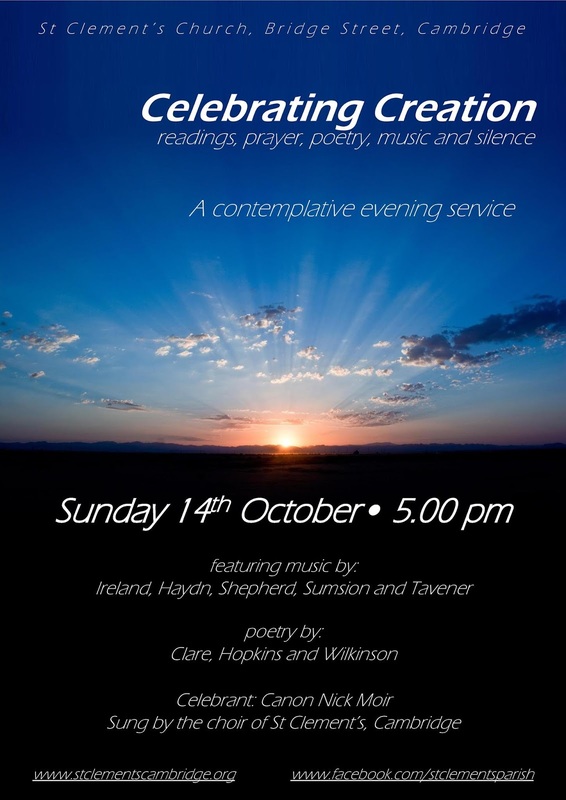 Join us this Sunday evening for a reflective choral service: Celebrating Creation, in this Harvest season. 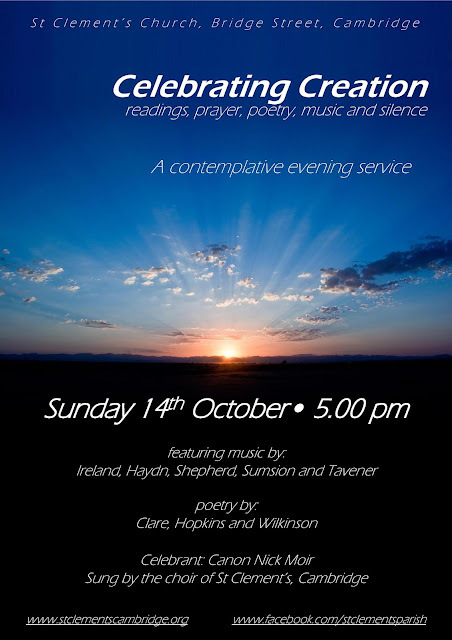 Blending readings, poetry, choral music, and silent prayer, this should prove to be a very moving and powerful service. The choir will be singing anthems by Haydn, Tavener, Ireland, Sumsion and Shepherd. Poetry by Clare, Hopkins and Wilkinson. All are welcome, and we hope to see you there! Please do join us this Saturday lunchtime for the next recital in this term's series. 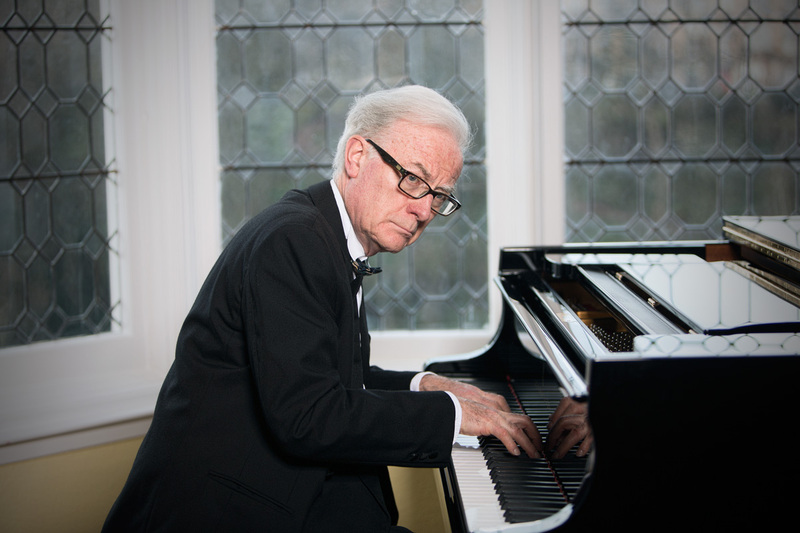 We're pleased to welcome pianist John Bryden, presenting a programme of Chopin and Schubert solo works, including Schubert's celebrated Drei Klavierstücke. John is an experienced musician, performing on both piano and organ in major concert venues in the UK and European cathedrals. He has worked with some of the leading musicians of the last decades, including Jacqueline du Pré and Claudio Arrau, and recorded on a number of prominent labels. 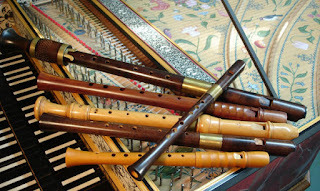 The recital begins at 1pm, and as ever, entry to the recital is free for all. A retiring collection will be taken to support the recital series, and continue to raise funds for the Organ Redevelopment Fund at St Clement's. We hope to see you there! Please do join us for the first recital of our Autumn 2018 series! Our opening recital takes a slightly unusual format, as we'll be joined with ClimateKeys, who are a global phenomenon that uses live music and concerts to encourage discussion and debate about climate change and solutions to global warming. Started in 2017, the movement has already seen dozens of performances and conversations across the world. Our recital in Cambridge will include performances by Paula Downes and Clare Bullimore, with a selection of vocal and piano works by Andrew Downes. Dr Hugh Hunt (a Reader at Cambridge University Engineering Department and Fellow of Trinity College) will give a talk "Can we refreeze the Arctic" and kick off an audience discussion before we conclude the recital with a final work performed by Paula and Clare. This promises to be a unique and engaging performance in the beautiful venue of St Clement's. We do hope you are able to join us! The recital begins at 1pm, with free entry to all as always. 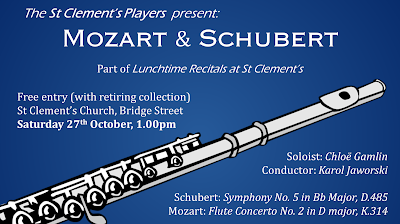 A retiring collection helps maintain the recital series, and raises funds for the Organ Redevelopment Fund at St Clement's. We look forward to seeing you there!